It was tired of being overlooked. Oh sure, it was tall and it was dignified. But, it was tired. Tired of people walking right past it and barely noticing. Tired of being more ‘function’ than it was ‘form’. It wanted to be ‘form’….it wanted to be wonderfully, beautifully ‘form’. And then, one day, there was a flurry of activity happening all around it. Drawers were being emptied, shelves removed, men coming in and taping and tarping and spraying. And then came the day when those tarps came down, the tape came off and…. …it finally had it’s moment to SHINE! No more hiding, no more being overlooked, no more people walking by without even noticing. It was finally the best of both worlds. Perfect function meeting perfect form! It loved that the little countertop area no longer disappeared as if it was in a cave. 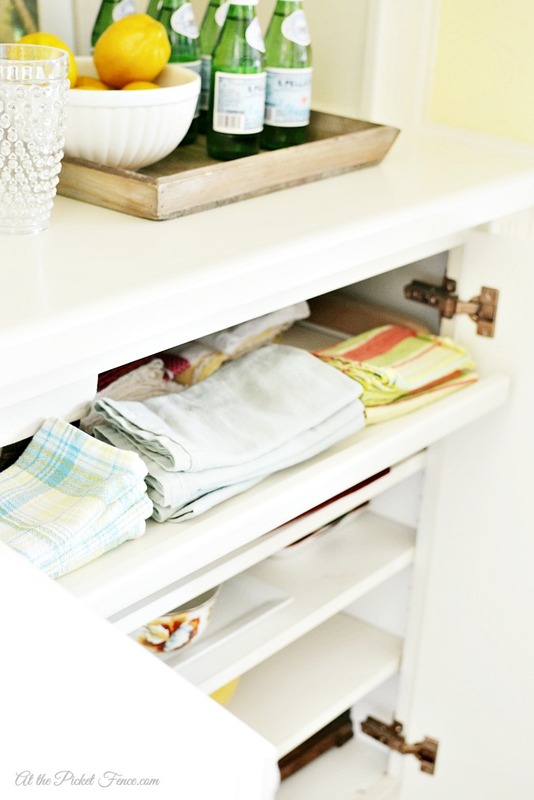 And how all of the linens in the drawer popped against the creamy white paint. 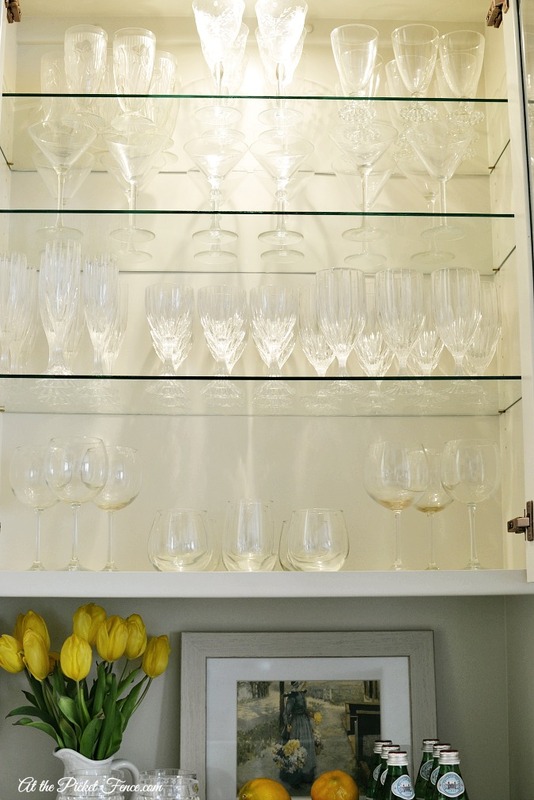 And the glasses…oh the glasses suddenly looked like glittering gems inside the cabinet. And while some may think that a paint brush should never have touched it. And while I may have been very worried about what people would say after a paint brush/sprayer touched it. In the end, it looks so happy and cheerful. And it makes me happy and cheerful every time I come in from the garage, through the laundry room and see it there in front of me. It’s still tall. And it’s still dignified. 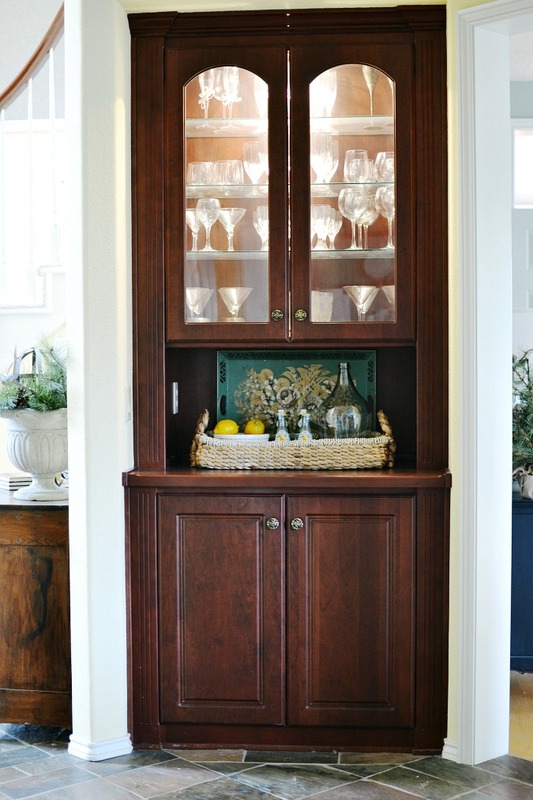 47 Comments on "Built In China Cabinet Makeover"
Brilliant! Well done. What type of paint did you use and did it take lots of preparation? Hi Debra! We had this professionally sprayed and I know the color was Neutral Ground by Sherwin Williams but I can’t remember what type. I’m thinking it’s a latex version. The only prep involved on our end was getting everything moved out and putting up with the fumes. LOL! Love it! I have two corner curio cabinets that are brown and in need of something, in need of a POP. I painted most of my wood trim white. Love it too!! Wow. What a change… Well done. Enjoy! The makeover is beautiful. I am looking forward to seeing what comes next! 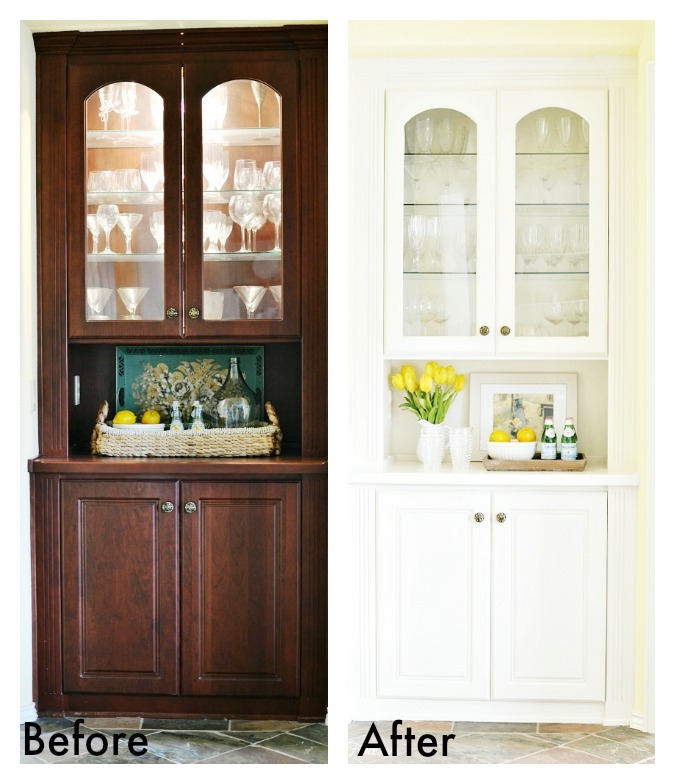 My kitchen cabinets are off white with a medium dark wood floor and I have always loved it. I am sure you will love your choice for many years! Hi Judy!! So I completely spaced out about making sure to list the color. LOL! It’s called Neutral Ground by Sherwin Williams and we did pay to have it professionally sprayed. We were kind of afraid that we wouldn’t be able to get it to look exactly like we wanted by doing it ourselves and there is honestly nothing quite like the look of having it sprayed. 🙂 Thanks for coming by sweet friend! Beautiful makeover! What a huge difference it made. It looks gorgeous! Beautiful!!! You can always paint or paper some foam core to put in the back, behind the glass shelves, if you want to change it up seasonally. I think you made a very good choice to paint it! Beautiful! I love the new, fresh look. Especially the pops of yellow, feels like spring. What color paint did you use? I am looking at having my cabinets painted. Thank you. Hi Marcy! The color is Neutral Ground by Sherwin Williams. 🙂 Thanks for your sweet words! Thank you so much for your response. Will check out Neutral Ground. Have a great day. Looks Fabulous. Don’t even try to justify this because it looks so AWESOME!!!!!! I love the light look too and think you did such a wonderful job making one part of your house look like YOU. Keep it up and remember that only you and your family live in that house so only you and your family should have a say in how you get to enjoy it. Love Love Love its new look Vanessa!! gorgeous, LOVE the lighter, brighter new look! Beautifully done! Now you can add some fabric to the back walls of the cabinets so you can actually see your crystal, add a pop of color & design & be able to change it around easily. Nicely done! Beautiful! Love how it turned out. Love the yellow pops. 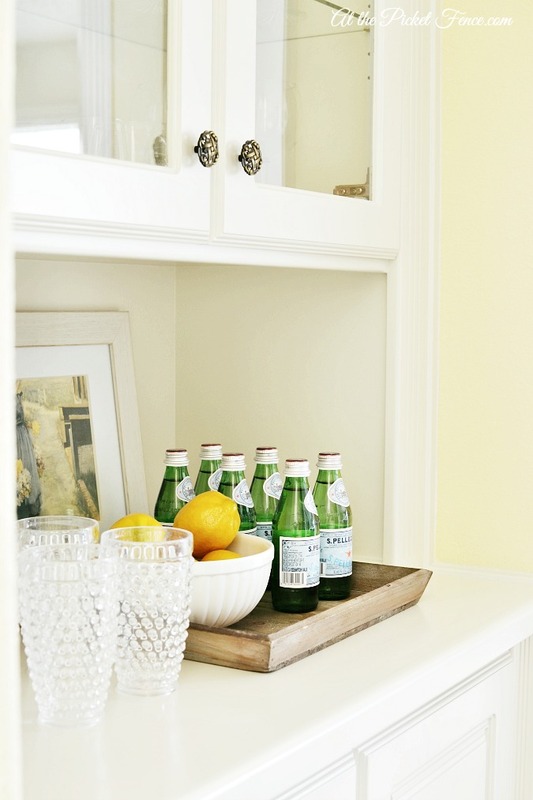 SW Neutral Ground is a great color. Keep on keeping on. I am easing my husband into accepting the fact that I want to paint some perfectly good oak cupboards. Too many color choices don’t you think? Love it!! Who cares what others think…you have to live in your house which means you should LOVE your house. I’m seriously contemplating painting ALL my kitchen cabinets with this glorious French Linen Annie Sloan chalk paint…haven’t gotten up enough courage yet. Oh, and I want to install a swing in my living room but my husband keeps saying no. So many ideas…keep up the good work Vanessa!! I love the idea of a swing in the living room! Just keep at him! When your cabinets are done in that “glorious” color and he sees that you have the knack you’ll get the swing! Good Luck! Love the hutch. What a transformation! And it does stand up taller. It’s perfect with the yellow walls. There is lots of color accent potential with this new look! Way to go Vanessa. By the way, it’s what you like and what’s appealing to you and your family that matter. It’s your home. The nay sayers can just go away if they don’t have anything encouraging to say! Definitely looks so much better!!! It looks gorgeous. I say paint what makes you happy. Life is too short. That looks really beautiful Vannessa! I am so glad a brush touched it! Wow what a great after it is stunning and looks amazing. Very nice job. If people don’t like it, they can strip it and re-stain it. I think it’s beautiful, and it gives me some courage, because I have an oak bookcase that has felt lackluster for some time. Beautiful! Love the change! 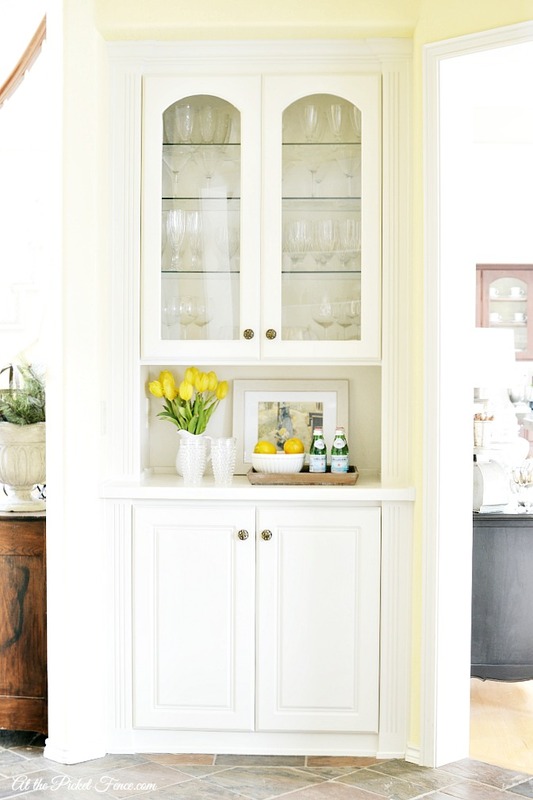 I also love the yellow wall color next to the cabinet. Do you know what color that is? I have got to make a change in the day-glo yellow that is my kitchen now – I love the soft yellow look but it’s proven to be tough for me to achieve! What an incredible transformation! I just love this! Your cabinet looks beautiful! Nothing like a classic white built in! It’s awesome, had to be scary because that original stained wood was gorgeous, but it just looks so right and so you and so incredibly perfect like that. Was right thing to do. Love it. Beautiful! I need those men with tarps and tape and sprayers to come to my house! There you go again, worrying about what wood nuts are going to say! You just gotta stop that! I love it, everybody else above loves it and YOU love it! What’s to worry about? ENJOY! I truly love both colors. And as one commenter stated, paint can always be stripped and wood stained and finished down the road when tastes change once again and we know that will happen. Be fearless! On my personal note because I do love both colors/finishes it muddies the water for making my decision which to choose for a new house. I keep changing my mind. 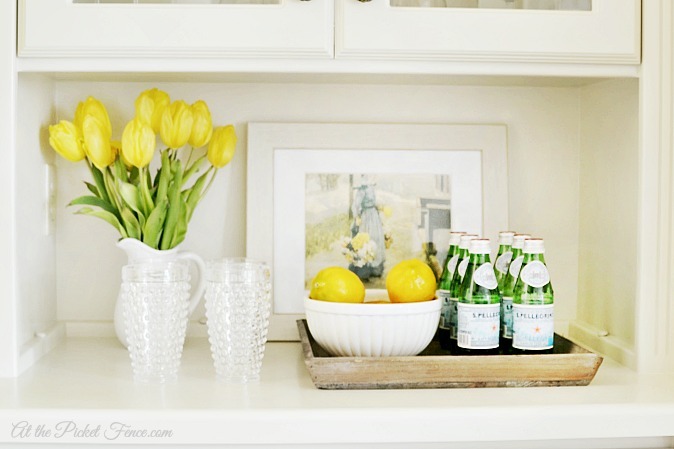 Are you changing your kitchen? It looks beautiful, Vanessa! So happy for you! Great job! Looks so clean, classy and elegant! 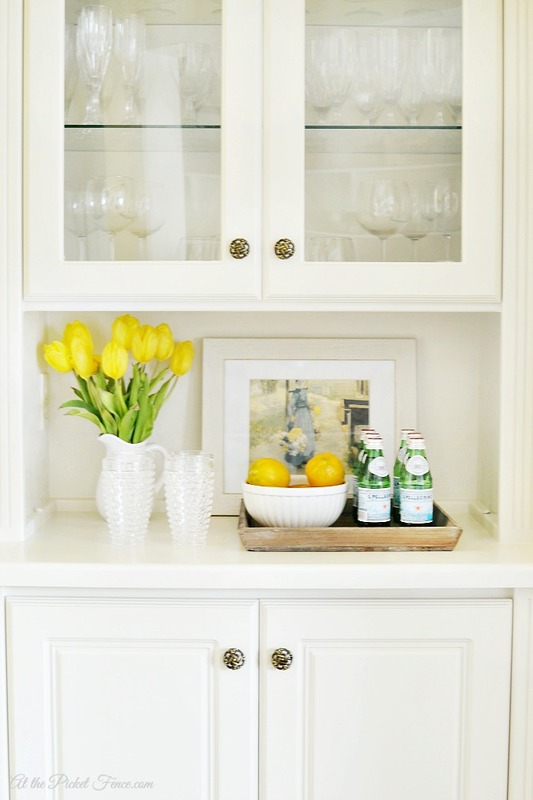 The makeover is very elegant and the cabinet looks a lot better on white. This kind of article is my very favorite on your site, as giving new life to blunt items is like doing magic. I am about to paint all my kitchen cabinets with Neutral Ground. I have been using it in the house already and love it! My question is what is the yellow you used. So soft and delicate. I might like to accent my kitchen walls with a color like that.